So through my blog creeping I have stumbled across several great cooking/baking recipes. I am (almost) always looking for new things to try in the kitchen, as my repertoire is not too extensive. Last month I came across a post at The Larson Lingo titled, "Cookie Snobs Unite." So I continued on and read the post, thinking "Hmm... She is a cookie snob." I quickly reminded myself that I have no room in the world to judge as I am a snob when it comes to pretty much anything I eat. Ask anyone who knows me at all and they will tell you that I am one of the pickiest, finickiest (is this a word?) eaters they have ever met. 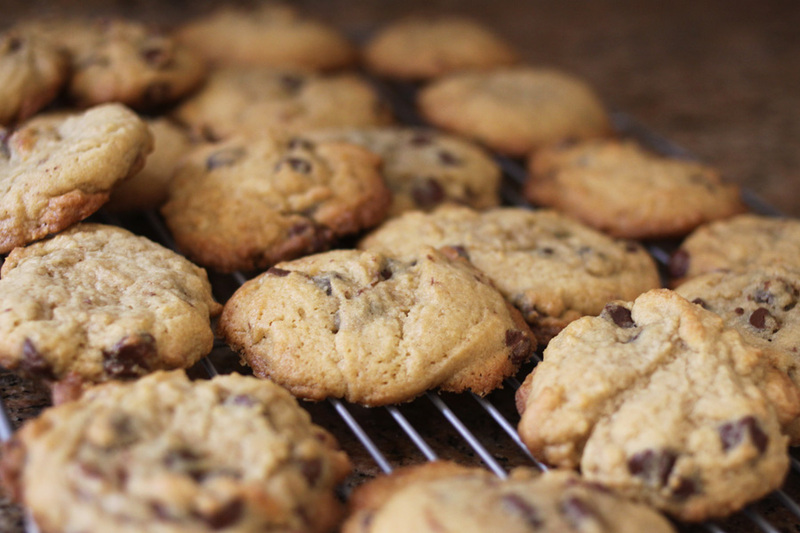 I love chocolate chip cookies, and they are pretty much the only cookie that I cannot refuse. It's also one of the only cookies that I like. I don't like nuts so that eliminates a large portion of cookie choices, and because I am so picky, I usually find other reasons why I don't like other cookies. When I was young, I memorized my Grammy's recipe for chocolate chip cookies and have faithfully made my cookies according to said recipe ever since. In the back of my mind I always felt that they were a little hard and non-chewy, regardless of how long (or short) I baked them for. But since I made them from her recipe, to me they were fantastically fabulous. When I was reading the post at The Larson Lingo, she described these snobby cookies as "thick and soft." Hmmm... This sounds like my kind of cookie! So, acknowledging and later accepting that I would be cheating on my sweet Grammy's cookie recipe, I decided to embark on trying this new one. For the most part, the new recipe (which I will later share) calls for everything that my Grammy's recipe does. The biggest difference was that this new one needs a package of instant vanilla pudding mix (I'm pretty sure this is what makes them so friggin' soft!). I am not exaggerating when I say that while at the grocery store to buy all the necessary ingredients, I stood in front of the instant pudding for a good five minutes, trying to decide if I believed Mel at The Larson Lingo that this instant pudding mix was really necessary. In the end, my compulsion for following rules won and I caved. I made the cookies per Mel's instructions, and HOLY COW!! These were the best cookies I have ever tasted. Even Ryan, who does not particularly care for sweets (especially cookies), ate several. Now that's really saying something!! As promised, they were thick, soft and chewy and duh-licious. My mouth is watering just typing about it. I have been meaning to blog this recipe to share with the blogosphere but I kept thinking that I wanted to take pictures as I went. This obviously would require me to make the dough, which means I would eat it. Then I would have to bake the dough, which means I would eat the cookies, too. Oh, the dilemma. I thought of the perfect solution. I'll type out the ingredients and directions and then give a link from The Larson Lingo with all the cute pictures and commentary. That way - everyone wins!! So, without further ado, here is an amazing recipe for chocolate chip cookies from one snob to another. I hope you'll try this new recipe. I would love to hear what you think... And if you are ever able to go back to your old recipe again. Those were very delicious cookies and I thank you very much for sharing some w/me. You neglected to tell the blog world that you love it when your Mom makes you chocolate chip cookie DOUGH using Grama Cupcake's recipe ... and that you & your sister prefer to eat the dough and not make the cookies. Just sayin.